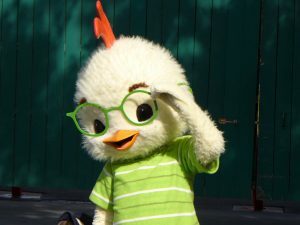 Chicken Little proclaimed, “The Sky is Falling”, warning all who would listen. Wikipedia tells us, “…Chicken Little … is a folk tale … about a chicken who believes the world is coming to an end. In grade school we crawled under our desks practicing bomb drills. Many people built bomb shelters. For 25 centuries people have been warned; yet so far the world has not ended. “… this financial paper money Ponzi scheme is getting very long in the tooth … Its days are numbered. Along with the guaranteed higher inflation comes the strong possibility that the entire world’s economic, financial and monetary system will go down the drain. “When no one wants to buy more US debt, that’s when a Minsky Moment will be on us in a heartbeat… And we all know what happens after the Minsky Moment, right? The Internet is full of warnings; reckless money printing and government spending cannot last forever. While there are signs pointing to a significant financial collapse, no one knows for sure if, when or what it will look like. Perhaps disaster is imminent; however the world is not coming to an end. A quarter-century later, November 1954, the S&P returned to the previous high. The catastrophic consequences of a major market crash, bond defaults, pension/social security cuts or currency devaluation would negatively impact us for the rest of our life. Baby boomers and retirees cannot afford to ignore the warnings. Today our focus is on common sense preparation for a potentially catastrophic disaster that might not happen. If it does, you will be doggone happy you hedged your bet! I went back to our friend Chuck Butler. He has a broad perspective and is very concerned about the “Minsky Moment”. No one wants to end up elderly, broke, hungry and humiliated. DENNIS: Chuck, neither of us enjoys warning readers of a potential disaster without providing hope and helpful suggestions. Thanks again for helping us work on the solution side of the discussion. What are some simple things readers can do to minimize their personal damage if the “Minsky Moment” occurs? CHUCK: I appreciate it Dennis. I don’t think the situation is hopeless or helpless either if people use some good common sense. It’s important to reinforce what you’ve already said. The catastrophic results of a “Minsky Moment” would negatively impact us for the rest of our life. Baby boomers and retirees can’t afford to ignore the warnings. No one wants to end up elderly, broke, hungry, and humiliated. So what can we do to protect our investment portfolios from a potential disaster? I have spent the last 25 years of my life emphasizing that diversifying your investment portfolio is of utmost importance. When I began trading foreign bonds, my boss, Frank Trotter, suggested I look up Henry Markowitz. 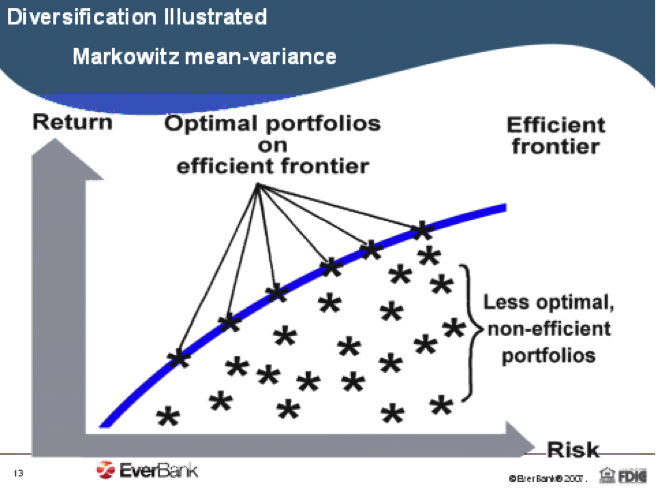 Markowitz was known as the Father of Modern Portfolio Theory (MPT). I’ve supported his viewpoint throughout my career. He believed the more asset classes you hold, the further out on the efficient frontier you get, and that reduces the overall risk of your portfolio, and provides a great means of return. Each asset class should have different pricing mechanisms and unique features; differentiating them from other asset classes in your portfolio. While you may get to the point of small incremental returns, the structure makes perfect sense because the goal is to avoid catastrophic losses and gain positive returns. These two facts bring everything to the forefront when talking about diversification. 1. 94% of portfolio return is based on asset class selection. 2. Diversifying in currencies and metals reduces the overall risk to your investment portfolio. A modern efficient (Markowitz) portfolio would hold: stocks, bonds, currencies, metals, cash, and other asset classes like land, and art. DENNIS: Let’s start at the top. You mentioned currencies. With most all central banks devaluing, how do you pick good diversification candidates? CHUCK: The way to value a currency is the same as valuing a stock; a currency is the Stock Of The Country. If you have a set of criteria that you use to value a stock before you buy it, then adapt those criteria to currencies. I always look at the balance sheet. Is the country a debtor or a surplus country? I look at the leadership of the country. Is it stable? Are they going to tax and spend their way into debt that’s unsustainable? What do they have to sell that other countries would want? Countries with raw materials will always have a flow of trade that helps their balance sheet. And finally do they pay a yield on deposits? Interest rate differentials have always been a key fundamental for currencies. When you go through that criteria for a country that you’re interested in, you’ll find that you end up with a handful of currencies that qualify. Like stocks, diversify within that handful. I could help you but that would be cheating – HA! DENNIS: We read a lot about metals these days. Gold stocks and some Exchange Traded Funds appear risky. What do you consider the safest way to protect your nest egg? CHUCK: I’m obligated to say it’s my opinion, and I could be wrong. Owning physical metals is the best and only way to ensure that you’ll have some protection against rising inflation or other bad things that might come along. You would be in possession of those metals. In my daily letter, “A Pfennig For Your Thoughts”, I say “gold”, but really mean all of the metals. I make that clear because I don’t want people to think I’m slighting Silver, Platinum or Palladium! Precious metals are a terrific diversification tool. They have different pricing mechanisms than stocks, bonds, and currencies. Unlike currency, gold holds intrinsic value. It’s not a government or someone else’s debt. It can’t be reproduced and printed into oblivion! Gold is an excellent asset class to hold should inflation take off. I believe it will eventually. There’s nothing like the feeling of carrying a Gold coin around in your pocket! I like to reference the US Debt Clock. Recently, they revised their website. Low-and-behold, they now give us a “dollar to gold ratio”. It represents the price of gold to the dollar based increase in Money Supply. It’s currently over $8,100/oz. DENNIS: Historically real estate has offered good inflation protection. Buying rental property is going into a new business that is time consuming and risky. What do you suggest? CHUCK: I doubt most investors want to deal with managing apartments, or rental houses, etc. And if you do, then good for you! What is left? Land. There’s only so much land in this country that can be used. Owning farm land that can be rented out or land that you can build on some day if you wish, or just go have a picnic on, or just hold as an investment class to sell one day. In Florida they aren’t making any more waterfront lots! DENNIS: Chuck, on behalf of our readers, thank you again for you insights. CHUCK: My pleasure Dennis. As you know, the dollar has lost a great deal of its value through the years. Right now it’s in a strong trend, and is ripe for a correction. I agree with Ed Steer when he mentioned that corrections take place quickly – in the opposite direction – a Minsky Moment! Boomers and retirees must diversify to avoid catastrophic consequences. Dennis here. I get a lot of questions about currency diversification. My wife and I hold FDIC insured Certificates of Deposit, denominated in foreign currency, with Everbank. We like the fact they offer several bundles within one CD. If the sky falls, who cares? Boomers and retirees don’t have time left to recover from a major market, bond or currency crash. Hedging your portfolio is prudent even if the event does not happen. The second week of college football is in the books. After seeing Northwestern lose to Western Michigan and Illinois State by a combined total of 3 points, I am not optimistic. Their schedule contains several highly ranked teams. I hope they can turn it around and get an invitation to a bowl game here in AZ. In the meantime Cub fans are anxiously holding their breath hoping they continue to play well. At our recent class reunion there was much discussion. They’ve not won the World Series in 108 years, could this be the year? Something always seems to happen; the wheels fall off and they remain, “Lovable Losers”. Promise me you’ll remember, you are BRAVER than you believe, STRONGER than you seem, SMARTER than you think. Hello There. I discovered your blog the usage of msn. This is an extremely smartly written article. I’ll make sure to bookmark it and return to read more of your helpful information. Thank you for the post. Thank you for taking the time to write. I appreciate the feedback. We are trying to build up our readers to the point where I can advertise on the site and keep it FREE. Every new reader helps. a taboo matter but generally people don’t speak about such subjects. Thank you for the feedback. In an upcoming column I quote a survey that shows 70% of the baby boomers they survived plan on working past their normal retirement age. I know too many people who have worked their tails off to accumulate a nice nest egg and then end up putting way too much at risk. The subject shouldn’t be taboo because it concerns a lot of people.